How to do a Waterfall Braid is a new back to basics tutorial. I have featured a few basic braid tutorials including How to Braid and How to Fishtail Braid so I figured it was a good opportunity to post a waterfall tutorial. Waterfall braids are a gorgeous way to wear a braid because most of the hair is still down and it’s as though your hair becomes it’s own hair accessory. ** Throwback: The original tutorial for the Waterfall Braid. With a part on the right side, take a section of hair on the heavy side of the part. Divide this into three sections and cross the back strand over the middle then the front strand over the middle. Next, cross the back strand over the middle and bring in a section of hair to create a french braid. Now cross the front strand over the middle and bring in a section of hair like in step 3. Next, cross the back strand over the middle and bring in another section of hair. This time, in stead of crossing the front strand over the middle, drop it down, and pick up a section of hair directly behind that strand. Cross it over the middle in place of the dropped strand. Now cross the back strand over and bring in hair per usual. Next, repeat step 6 dropping the front strand and bringing in a replacement strand. Repeat steps 5 through 8 until the braid reaches the back of the head. Continue braiding the three strands down into a regular braid and pin it against the head. Lay hair over the top of the pin to hide it. Thank you so much for this amazing braid!! Its incredible! I had my graduation last night and I had like 7 people comment on my hair!! That was so so soooo amazing thats my fav. braid because of you!!! Melissa, your tutorials are just amazing! I just wanted to say that I’ve followed you waterfall braid tutorial and the result was magical. The first time I’ve worn this hairdo was 2 years ago when I went on a date. It was summer and I was wearing a colorful dress. The night turned out to be quite spectacular and we’ve been together ever since. So, thank you for contributing to an amazing night through your work. Do you have to do a right part ?? Thanks this was really helpful!! Ahhh. Thank you! 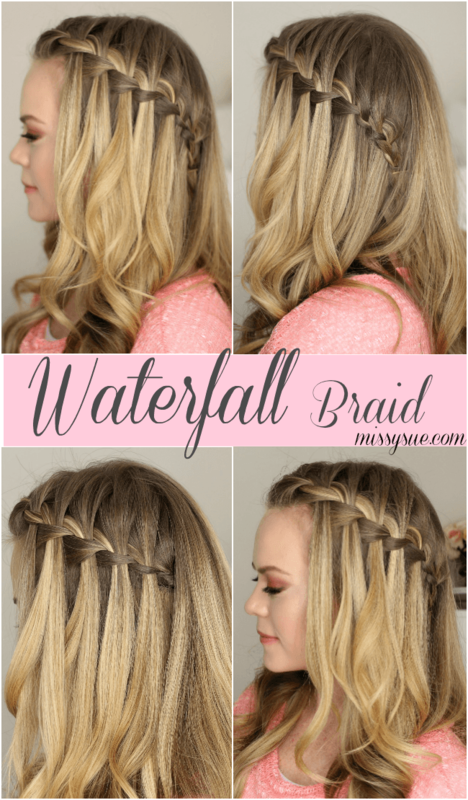 Yours is the only waterfall braid tutorial I’ve seen that makes any sense! I am usually really good with braids but this one has had me stumped for some silly reason. Pinning now!! Beautiful… But I can’t do that, because my bangs aren’t long enough. Your hair looks like it’s a bit on the thicker side…am I correct? I have very straight, zero volume, fine blonde hair that is long, about to the bottom of my shoulder blades. There are a lot of strands, but they’re just not thick. I can put various products in it and blow dry it, tease it and about 2 hours later it’s as flat as can be :( Can I accomplish the waterfall braid (and really any of your other awesome designs) on my hair that is so fine and long with no volume? Love your tutorials!! Thank you! I love your hair tutorials!